Do you have enough cabinets in your kitchen? 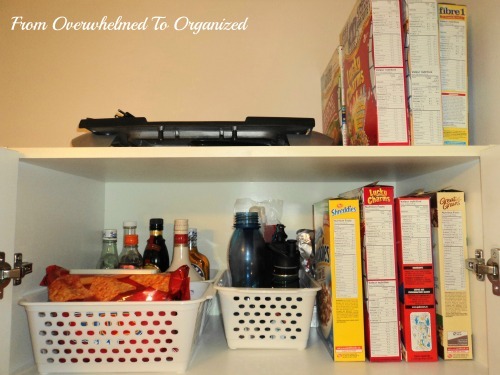 Do you get frustrated when you can't squeeze enough into your cupboards? 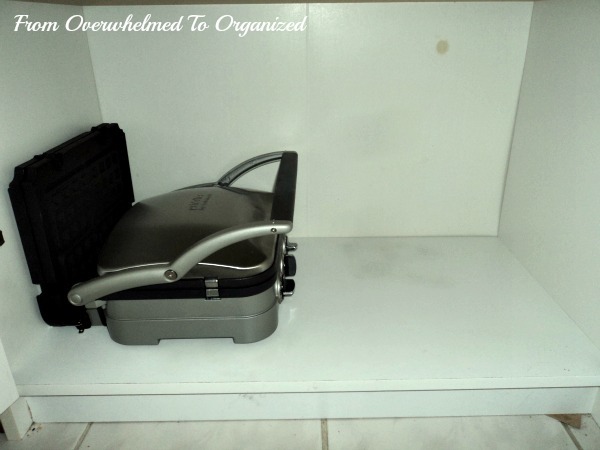 Do you struggle to get something out from the back of a cabinet because it's just too crammed full of stuff? Kitchens are the hub of our homes. We need them to function well. But they are often one of the most cluttered rooms in our house! No matter what size kitchen you have, it always feels too small. But it doesn't have to be this way! Today I want to share a way that you can make more space in your kitchen cabinets, so your kitchen won't feel as small. You can do this by using items that have multiple purposes. Before we get to that... you know I always recommend decluttering when you feel like you don't have enough space! 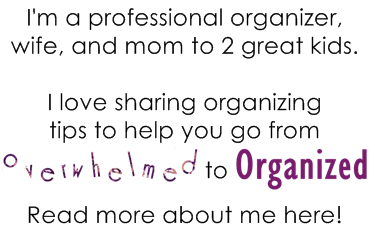 In fact I did a whole series on how I decluttered and organized my kitchen (with a heavy emphasis on the decluttering side... my kitchen is pretty small!). I really believe decluttering can make your kitchen feel bigger! 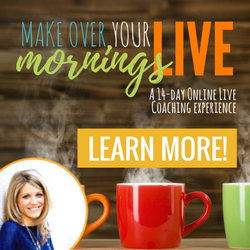 I've seen it with my clients who call me because they're frustrated in their kitchens. After we declutter they're amazed at how much more space they have and how much more they enjoy being in their kitchen. So ,if you have things in your kitchen that you haven't used in over a year, please let them go. 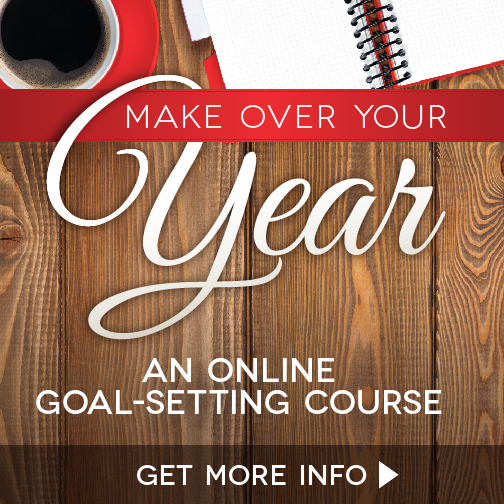 You'll be so happy you did, because it will free up more space for the things you actually use every day, or every week, every month, or even for those special occasions once a year! You have an overflowing food-storage containers cupboard with many containers that you only use for certain types of food, but you could use less containers and use them for a wider variety of foods. You have tons of pots and pans because you prefer to use certain sizes for certain types of foods, but by using a only few pots/pans for more than one purpose, you could reduce the number of pots and pans you need to store. Same idea for baking pans and cookie sheets. And don't even get me started on how many big spoons and spatulas/flippers you probably have, if you're anything like most of my clients (and like me before I started really decluttering!). You can probably get by with much less than you have, which will make your utensil drawer much less overwhelming. OK now on to what I really want to talk about today. Using items that have multiple purposes. This is a huge space saver! You have a drawer full of tangled charging cords for all your different devices, but you could use a multi-charge adapter to charge all your devices with one cord. You have an overwhelming under-the-sink cabinet full of various cleaning products, but you could use a multi-purpose cleaner (or DIY cleaners like baking soda and vinegar) to make that cupboard more manageable and simplify your cleaning. Your junk drawer has several single tools taking up space, but a multi-tool could replace all of them and meet your need for a few tools for simple jobs. I'm sure there are lots of other ways you can combine things in your kitchen to save you space! I'm really speaking to the average person who cooks because they need to eat. Or their family needs to eat. You know... those kids who just keep growing and wanting more and more food :) And you're overwhelmed in your kitchen because you have too many things. A few months ago, I became frustrated with how many different small appliances we had in our kitchen. We had a sandwich maker, a griddle, a small George Foreman grill (that wasn't even big enough to grill 2 burgers on at once! ), and a waffle maker, and they all basically plug into a wall and heat a variety of foods on similar surfaces. I thought, there has to be some kind of all in one appliance with interchangeable surfaces that would take up much less space. 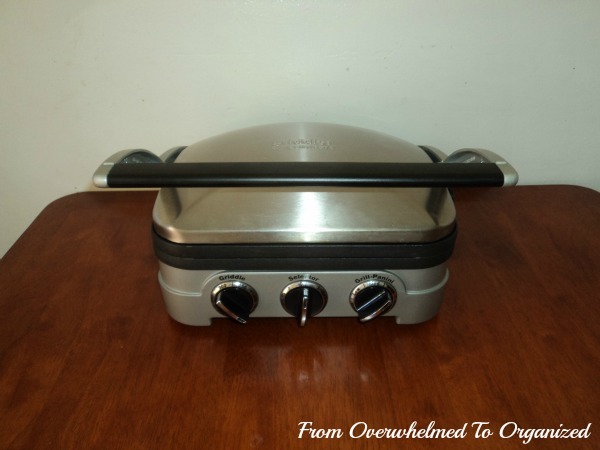 So I started looking around and I found the Cuisinart 5 in 1 griddler. I was immediately struck by how much less space this would take than all our separate appliances! And it seemed to do the same job. I read some reviews and researched prices and waited for a sale. 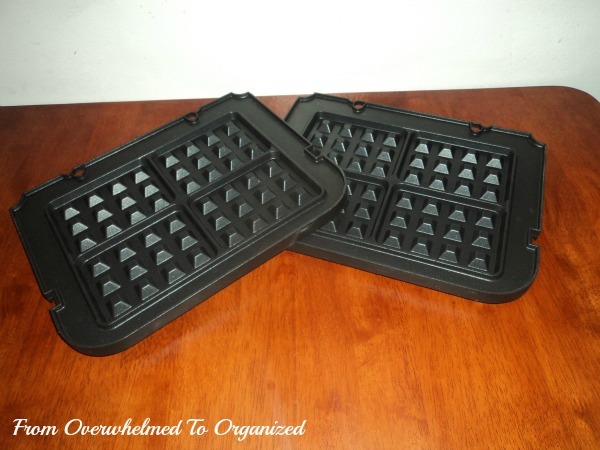 There are also waffle plate inserts you can buy separately or the waffle plates come in a bundle with the griddler. Initially I didn't buy the waffle plates because I wanted to make sure we really liked the 5-in-1 machine first. But we definitely did so I used some gift cards to purchase the waffle plates last month. 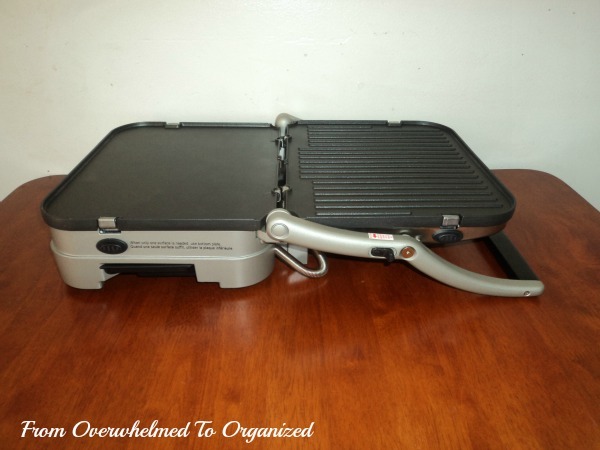 This griddler is so multi-functional! It replaces our griddle, our small grill, our waffle maker, and our sandwich maker. 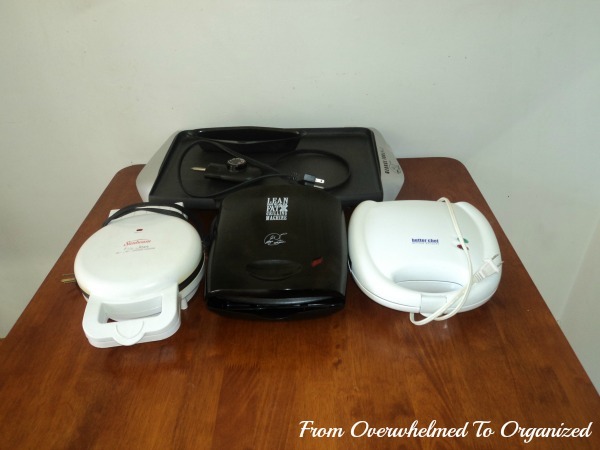 Now that I know we really like the 5-in-1 griddler, and we haven't needed any of our old separate appliances, I'm going to give those away. Look at all the space that saves! I'm not sure if you remember when I organized my pantry a few years back... here's our griddle way up on top of the pantry (it always bugged me up there and it got dusty between uses because it was out in the open). And here are the other 3 small appliances on the bottom shelf (the 3 on the left). Aside from the space saved, the griddler makes clean-up much easier... just toss those removable plates in the dishwasher! I'm so happy with this 5-in-1 griddler! It's saved me space, made cooking and clean-up easier, and made my kitchen feel bigger by reducing the amount of appliances in it. Now is a great time to declutter your kitchen before all the holiday entertaining and baking happens :) Stay tuned for a couple more posts in this series! 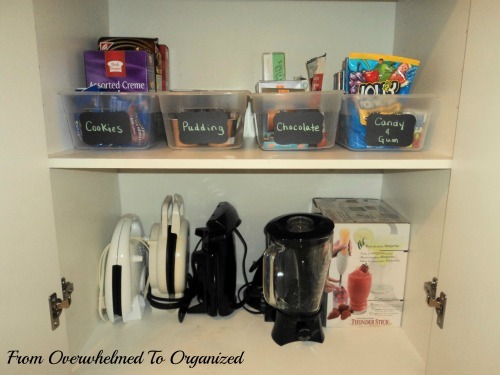 For more tips like this, you can check out my Kitchen Organizing board on Pinterest. 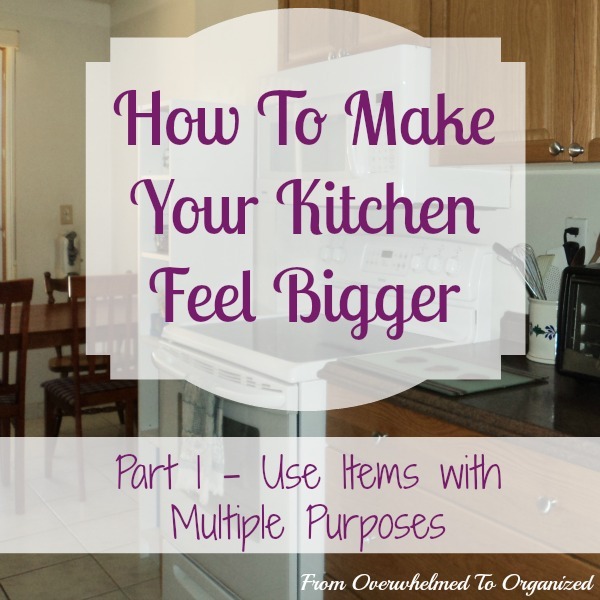 What can you declutter from your kitchen to make it feel bigger? Do you have any multi-functioning items in your kitchen that save you space? Is there a category of things in your kitchen that you want to replace with one multi-purpose item? I wonder if we will stock the 5-1 griddler here in New Zealand, if we do...I am totally buying one! I'm always struggling with stuff on the counters... Appliances are so big - like keurig and toaster oven that we use daily. But I need to declutter some doubles of kitchen items I've got. Can't do much about the size of appliances, especially those you use all the time, but decluttering doubles definitely helps Danielle! 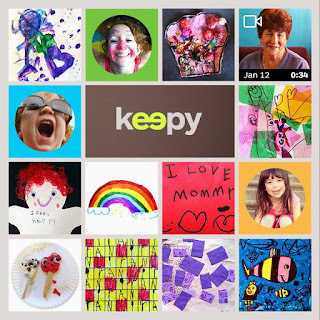 So many great tips! I have far too many gadgets and I always wonder how I can live without them! Thanks! One way to see what you actually use it to put all the gadgets in a box and as you use them put them back in your drawer. Then after a month or so you look at what's left in the box. Unless there's a reason why you didn't use something, most of it can be donated because you know it's not stuff you use! I agree with purging the contents first. I always tell people all you need is a good sharp knife to begin with. You don't need all the gizmos and gadgets, spend the money on a good quality knife instead. We have that exact same Griddler - it's one of the best purchases we ever made! We can't barbecue where we live, so it's especially handy in the summer when it's too hot to turn on the oven, but we use it all year round, often several times a week. That 5 in 1 seems awesome. I've wanted to replace my old griddle because it's too big to fit anywhere so stands up on the pantry floor. I wanted a smaller one now that the boys aren't living at home and I don't need that huge one and it's a pain to clean too. Thank you Hilda I'll be checking that out and I'm sure we have it in Alberta. 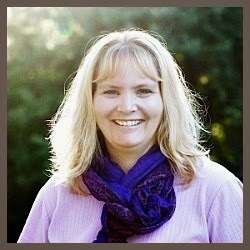 Happy to help Cathy! You'll love it... I know we do!